What happens when you mess with a mother goose sitting on a nest? Well … let’s just say that you don’t want to find out! Geese create many conflicts with people. Collisions to aircraft, aggressive geese that are nesting, droppings on golf courses and walkways and contamination of water sources are just a few of the problems. 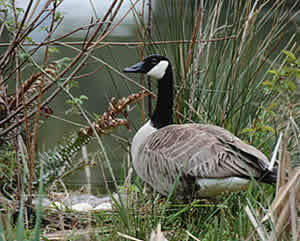 Goose populations have swelled to out of control numbers in some areas of the country. These higher numbers cause geese to show up in areas they normally would not have. It is not uncommon for a goose to hatch out a nest of eggs right on a patio! Geese must be kept at safe distances to protect people, property and aircraft. The Certified Geese Management Professionals at A All Animal Control know how to resolve your geese problems. Call on us for assistance with your geese management programs.